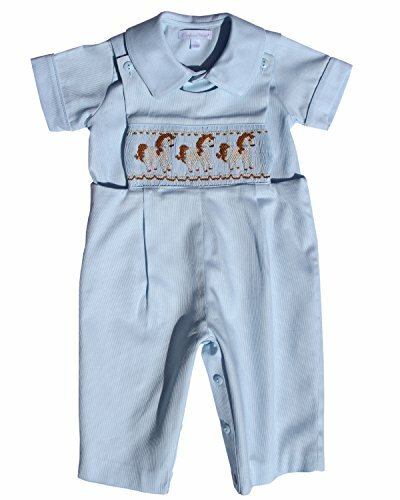 This sweet boys blue longalls are simply gorgeous, with three horses hand smocked across the chest is hard for your boy no to be the center of attention on your get together, the workmanship is outstanding, the fabric is cotton pique, perfect for fall and winter wearing the matching piped shirt. These little outfit is completely lined, and it will be perfect for your little boy birthday portraits. Runs true to size. This is such a fun outfit, your little boy will look so handsome in it, and if you are looking for matching sisters clothing, we have available the little baby girl pink long jumper, so gorgeous!! And to top it off, we have the white bishop with the same smocking design. Those family portraits or events are going to be fantastic! I hope you enjoy them very much as much as we did creating them, and FYI once they are gone, they are gone. Gorgeous hand smocked 2 piece outfit for your little cowboy. Hand smocked children carousel horse across the chest by skilled artisans. Pale Blue cotton perfect for Spring, fall and winter. Matching pipped shirt and buttons down the front. Traditional Southern Children smocked clothing for family pictures and portraits or if you go to the Kentucky Derby with your little boy! By DAVIS' MEN'S STORE, INC.